Clara May Ford, age 83, of Marble Hill, MO, passed away Saturday, September 24, 2005 at the Southeast Missouri Hospital in Cape Girardeau, MO. She was born October 30, 1921 in Marble Hill, MO, daughter of Leander H. and Louisa B. Beel Null. 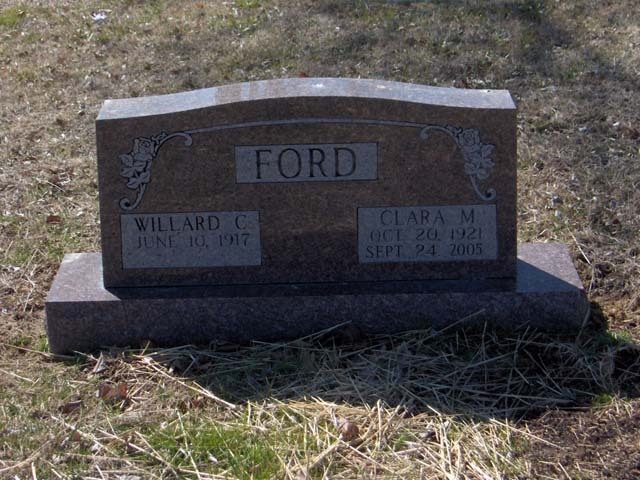 She and Willard �Bill� Clinton Ford were united in marriage on March 4, 1939. She was a home maker and a member of the First Baptist Church in Whitewater. Survivors include; her husband Bill, one brother Louis "Doc" Null, Marble Hill, four sisters Mildred Vangennip, Advance, Maude Crites, Union Mills , IN, Dorothy Woodfin, Marble Hill, Melba Huffman, McClure, IL. She was preceded in death by her parents, two brothers John & Glenn Null and two sisters Alma Carpenter and Elsie Crites. Memorial Contributions may be made to the Whitewater Baptist Church, the American Cancer Society or the American Heart Association. Visitation will be Sunday, September 25, 2005 from 4:00 to 8:00 PM at the Liley Funeral Home in Marble Hill. Funeral service will be Monday, September 26, 2005 at 10:00 AM at the funeral home with Rev Phil Berry and Rev. Dale Huff officiating. Burial will follow in the Bollinger County Memorial Park Cemetery in Marble Hill, MO.